Willow has MPSI Hurler disease, a rare genetic condition which is progressive and life-limiting, causing damage to organs and the skeleton. She has had a bone marrow transplant which has improved her symptoms but Willow still experiences constant pain, poor balance and cannot walk more than a few metres. 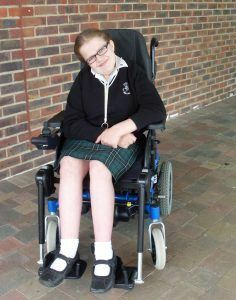 The Elifar Foundation has funded a powered wheelchair costing £4,500 for 13 year old Willow to enable her to cope with life at her large mainstream secondary school. The chair also helps Willow to do more activities outside of the home with her family and to attend Girl Guides and swim after school.